Kara pori is one of my favorite snack. I always have it prepared at home, so that when ever I feel like eating something, I snack on this. This is easy to prepare, tastes delicious and is low in calories. Today we will learn how to make spiced puffed rice following this easy recipe. Heat oil in a pan, fry peanuts and fried gram separately. Keep it aside. In the same pan, heat more oil, add mor milagai, hing, curry leaves and fry for a few seconds. The add puffed rice, turmeric powder, salt needed, chilli powder and fry till pori becomes crisp. Mix in peanuts, fried gram and store it in an air tight container. Enjoy this guilt free snack whenever you want. It tastes great with the mor milagai flavor. 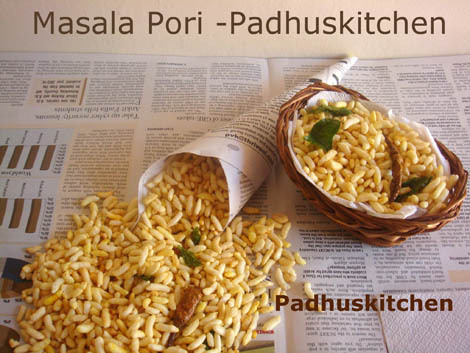 Variations - Instead of mor milagai , you can add 2 crushed garlic for garlic flavored puffed rice. Meet you all with more interesting recipe. Superb, looks very inviting, nice idea with the moru milagai.. It's my favourite tea-time Snack! Looks so Yum! Look yummy!! Feel like digging into it right now! thank u soo much for ur dishes. this is d first time for me to know about this karapori.it looks yummy.i wanna try this sooon. I wanted to eat karapori for a very long time, n finally tried it today after seeing your recipe . it came out so well that we completed almost half of what i made..
where does one find mor milagai/buttermilk chilli ? How to make mor milagai/buttermilk chilli in home ?